Have you ever sat in an airport, staring at a person across from you or in your terminal, and wondered what their story was? In Something Real and Good, that story is played out. It is a story about him and her. Seriously. When their flight gets delayed, they interact with each other to pass the time. He gets caught staring at her while she's listening to music and the conversation begins. The initial connecting flight is delayed for several hours in the airport and the two lay the foundation for the night to come. His attempts at flirting are met with resistance, but curiosity as she, in her defensive ways, gets to know the man four years her elder. Once the flight is back on, the two coincidentally end up sitting with one another. Alright, so a "swindling" occurs on his end, but the two do sit together and learn mid-flight from the pilot that their flight is taking an emergency landing in another city due to weather conditions. After furthering their connection on the flight, the two decide to stay in the same hotel complex. From there, their night is filled with outlandish, childhood acts of amusement as well as deep, thought-provoking conversations that open each other up from their guarded selves. The topics range from his feeble attempts at intellectual conversation to why she rubs the lining of her jacket. Why Gwen Stefani caused him to steal and the reason she loves the sound of a good slap. The questions about life, love and the pursuit of happiness and whether or not it's even worth it. He and She develop a chemistry that at times seems highly unlikely, but do to their life circumstances, they find comfort in each other's company. This is a movie that will not appease to everyone. There is very little action and is heavily character driven. There are long moments of dialogue and a few musical montages. However, I'm one of those that loves this genre of film and the story. Written by Erin Carroll and directed by Luke Rivett, Something Real and Good is a story of connection and the moments where we feel that there is none. With the main characters being in their early and late twenties (23, 27 respectively) and me being in the middle, the concerns of each character resonated hard and I found myself emotionally attached to both characters and their struggles. Matt Jones does a fantastic job of playing Him. He is a rich character full of humor, but also sensitivity. His backstory, once peeled away, is engaging and makes you realize why is the way that he is. The true star of the film, in my opinion, is Alex Hannant. In her first feature film, she is phenomenal. The Her character has so much depth and maturity at such a young age, but is also conflicted with the uncertainty of the future. While her guard is up for the majority of the film and she uses many verbal defense mechanisms, the conclusion of the film fully lets you in and completely relate with Her. I absolutely loved the character and her traits and am truly excited to see what Hannant is involved with in the future. There are few moments of awkward pacing, line deliveries, and other character interactions (i.e..Kid on the plane), but the good outweighs the bad in this film. Something Real and Good is a film that I would have loved to have come up with. I say that because it is a story about finding one's way and realizing that sometimes it is easier to battle together than to fight alone. The dialogue is the best part of this film, as it's supposed to be. Witty and sharp and insightful, but fully accentuates the characters. Rivett's direction is wonderful and the cinematography is great. Jones and Hannant have excellent chemistry with one another and once again stating, Hannant steals the show. An exceptional film filled with humor, insight, and release. It's as if this movie crept in my head, read my thoughts, and played them out over an hour and twenty minutes. 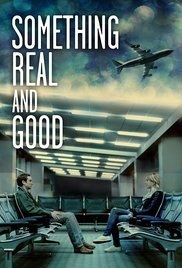 Something Real and Good is currently available to stream on Hulu.